Chicken lasagna is my comfort food. I can eat it at any time of day without arguing. The hot oozing cheese and buttery white sauce make it taste heavenly. Here is a perfect recipe of lasagna for you to try. I took this recipe from food fusion. In the pan, add oil and onion (chopped) and garlic (chopped), sauté for 1-2 minutes. Add chicken mince and sauté until mince changes color. Add tomatoes (chopped), tomato ketchup and mix well. Add salt, red chili crushed, black pepper crushed, dried oregano, tomato paste and chicken stock or water, cook for 2-3 minutes. Add capsicum, mix and set aside. In the pan, add butter and let it melt, add all-purpose flour and mix well. Gradually add milk and keep stirring and mix continuously. Add salt and white pepper powder and cook until sauce thickens. 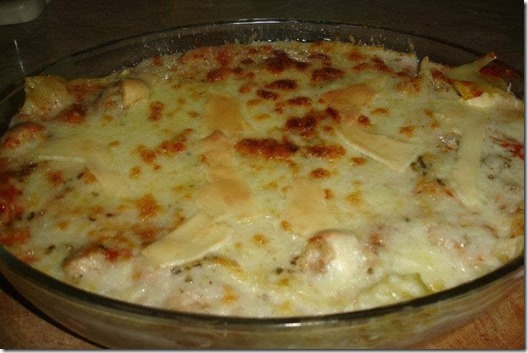 Grease baking dish with oil or butter spread white sauce, cover it with lasagna sheets, add chicken filling then again pour white sauce, sprinkle cheddar cheese and mozzarella cheese. Sprinkle cheddar cheese, mozzarella cheese and dried oregano. Bake for 20-25 minutes at 180 C or until cheese is golden brown.